Join the discussion on our forums! Come discuss Replicating Menace over in our dedicated Replicating Menace discussion topic. One of the best mechs, period. Anything with magnetic and either a decent attack for its cost or a defensive ability will be absolutely insane and this one has both. Mech decks WILL be a force to be reckoned with!!! What makes you so convinced mech decks are a thing? There's hardly any mechs revealed that are really good on their own, zilliax is about the only good one, hunter one is good too not because it's a mech but because of it's deathrattle. I mean this isn't going to be like "freez shaman" but I'm not sold mech decks can stand up to the top tier decks today, least not with what's revealed so far. We have yet to see really good 3 drop mechs. Also this is not a well stated minion, just compare it to egg napper. 3 1/1 death rattle is worth about 2 mana. I don't see how u can justify paying 2 mana for a 3/1. It's like a worse mech version of egg napper, def not worth 1 mana to get an extra 1/1 on top of 2. 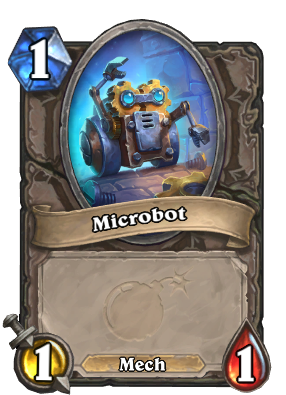 Do the Microbots do anything or are they just vanilla 1/1s? It's a robot with boobies. Two ways to use this. First is by making use of magnetize. 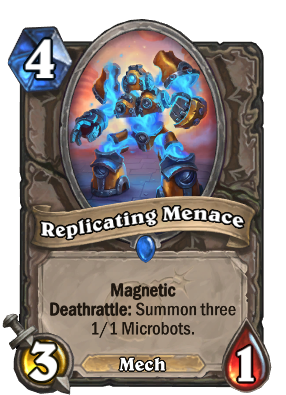 Give your mech +3/1 and the deathrattle which primarily you will use it for the attack boost. The microbots will just give more mechs to target in the next turn, but in this scenario are slower to make use of. 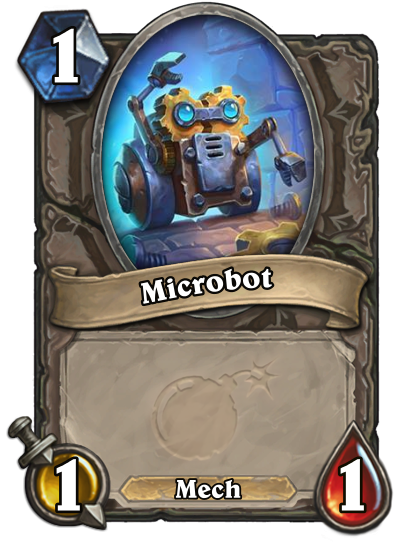 The second use is with Dr. Boom, Mad Genius In which you give it rush and the microbots after rush. So 4 mana deal 6 damage to minions. Will most likely fit best with the second option, but is not ideal as a standalone card to play without those given conditions. So will probably be designated as more of an Arena card. And if you have a mech that can attack, that's the end. Armor tank this Druids. Or just Glinda Crowskin, Mechwarper x5, Zilliax x Infinity (which for the record is from a video by The Penniless Priest. Key difference, you can't kill them with Zilliax. You need an extra mechwarper on board, which leaves no room for a mech from last turn that can attack right away. Now that theres a 4 mana magnetize minion the combo can also be lethal. Can be compared to Flanking Strike . It is better than it if you manage to magnetize it to a mech and its not than bad to play it alone.